Located in the northern Sporades, between Skiathos and Alonnissos, Skopelos Island is 21 km long and at its widest, 8 km across. 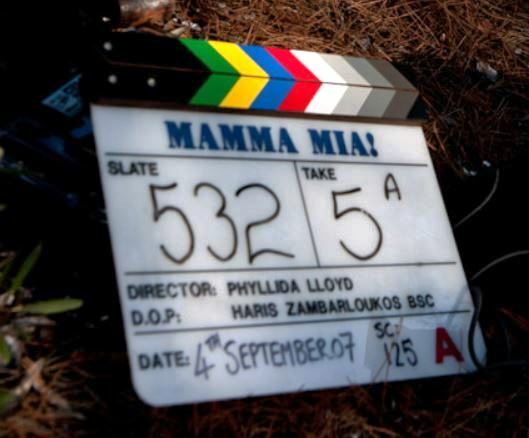 The island gained international attention as the location for the 2008 movie ‘Mamma Mia’. In fact, the lovers’ reunion scene was filmed on the dramatic ocean side cliff and church at Agios Ioannis (pictured above). Prior to the movie, the island had already entered the hearts of many visitors to Greece for its unusual combination of aqua waters, quiet beaches and dense forests. 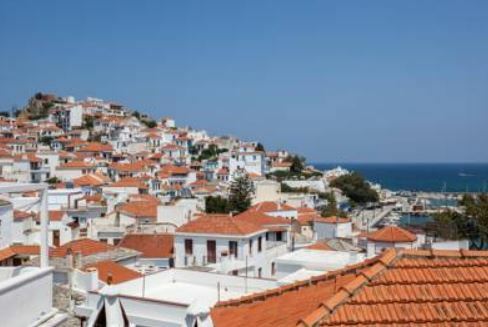 The town of Skopelos (above) begs to be explored, with its winding streets and plentiful, affordable shops featuring local artisans and delicious restaurants. Walking downhill, we are surrounded by whitewashed houses and balconies draped in brilliant bougainvillea with the heavenly scent of jasmine. Visit the many churches and beaches, or enjoy an evening stroll by the bay. Gladly the island remains authentic and virtually untouched from its brush with fame and pop songs, retaining its Greek character and plenty of wide open spaces. Small boats offer day tours to secluded neighbouring islands. The other main town on the island is Glossa, which is smaller and quieter and elevated, allowing spectacular sunset views across to Skiathos and the Pelion peninsula. 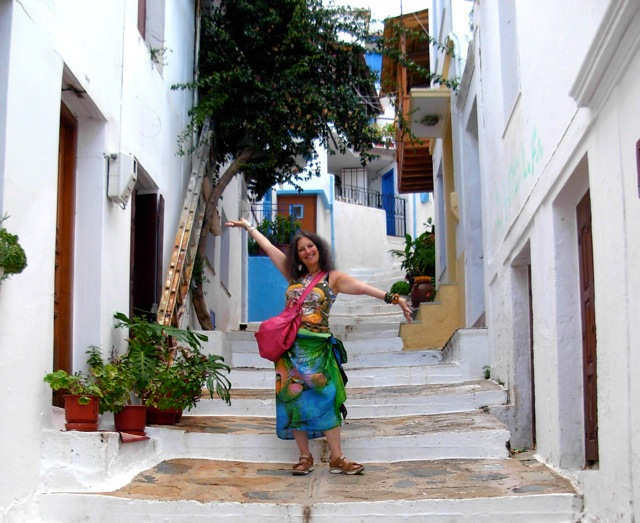 The history and culture of the tiny island of Skopelos Greece beg you to experience all there is to see and do in this uniquely beautiful setting. 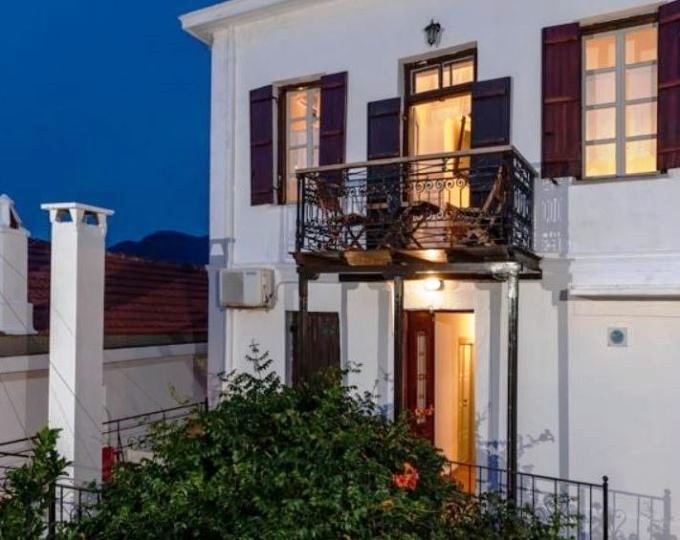 Traditional House in Skopelos Town (above) is a beautifully restored mansion right in the middle of town, with wooden doors, charming patios and courtyard, this stylish choice will not disappoint. The host Evangenlina looks after all guests with true Greek hospitality, visitors also have a kitchen and a fridge in the room. 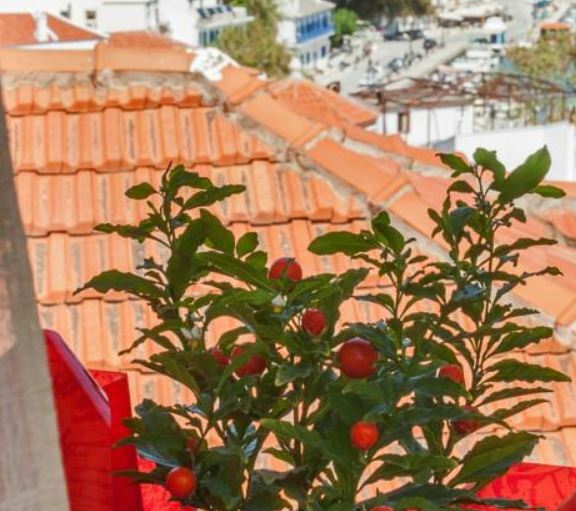 With stunning views over terracotta rooftops to the port, this is a great location as your temporary home while exploring the island. 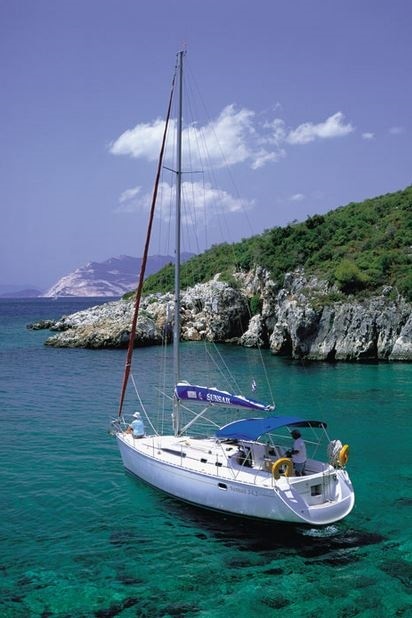 Travel Skopelos - there are a few different options of transport to get to the island. Ferry - as the island has no airport, you need to get to neighbouring Skiathos island and then take a ferry to either Glossa (Loutraki) or Skopelos Town. The ferry to Loutraki the port of Glossa takes about 20 minutes and to Skopelos Town about 45 minutes, the scenery from the water is magnificent (pictured above). Flights - fly into Skiathos (JSI) from Athens (ATH) with Olympic Airlines - the flight takes about 45 minutes. 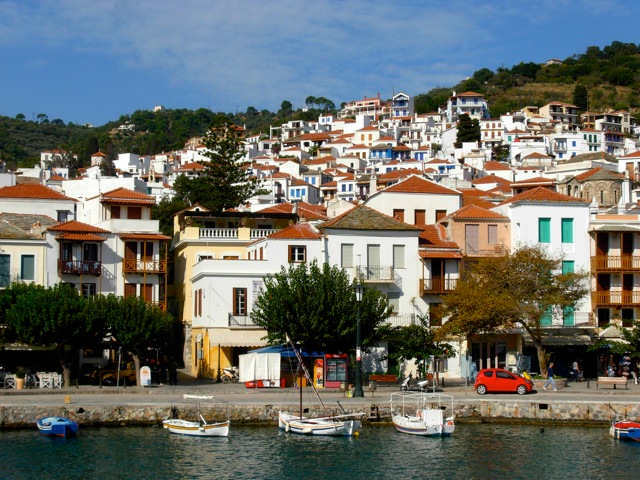 Volos Flight Ferry Combination - during the summer months, flights from all over Europe fly into Volos on the Greek mainland, then travellers take a 2 hour ferry ride into Skopelos Town. Car ferries can take longer. Yacht - you could of course choose to sail to Skopelos, yachting is very popular in the Sporades due to calm waters and incredible scenery (pictured left). From Crete - fly from Chania (CHQ) or Heraklion (HER) to Athens (ATH) with Olympic or Aegean Airlines around midday, with a flight time of 50 minutes, and as little as 35 minutes transfer time, then a 45 minutes flight to Skiathos (JSI) meaning a total travel time of 2 hours and 10 minutes. Then take the ferry as shown above, and you can relax on Skopelos in the afternoon. There are at least 5 flights a day from both airports in Crete to Athens, so take your pick, as long as you meet up with the one daily flight from Athens to Skiathos that departs around 5.15pm. Climb the cliff top where 'the winner takes it all' was filmed - near Agios Ioannis chapel (pictured below) where the wedding was set. The interior shots were filmed elsewhere (Church Panayitsa tou Pirgou) in town. 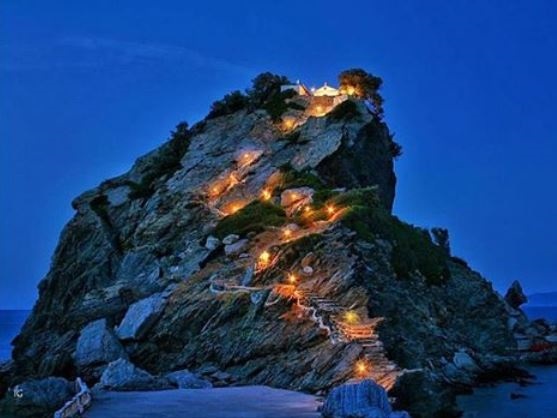 This has to be one of the most romantic places on the island, located in the north west, it is 34 km from Skopelos town via Glossa. 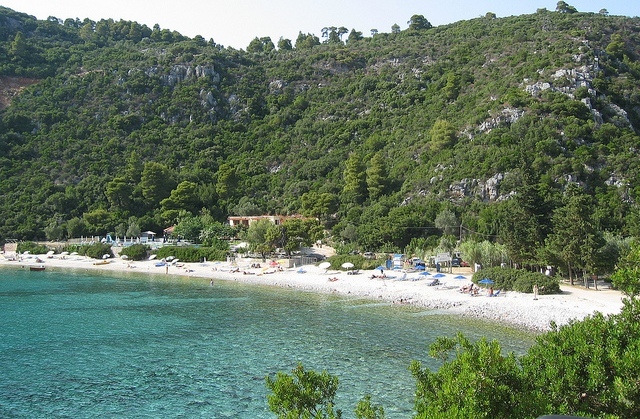 Other Skopelos film locations included Port Agnontas, Kastani Beach, and the Three Trees at Cape Amarantos. Other filming took place in Damouchari on the Pelion Peninsula in mainland Greece. Kastani Beach - is located about 14 km west of town on the western central coast of the island. This is a stunning pebble shingle beach with beautiful steep forested hills coming right down to the water. This is where many scenes were shot, including 'lay your love on me' and the arrival of the three fathers. A jetty was built here for filming but was taken down after the shoot. Get to the beautiful fishing cove of Agnontas via the lovely beach of Stafilos, just a 14 km drive south of town. This has to be one of the most idyllic locations in Greece. Eat with your toes in the sand, the freshest seafood on your tastebuds and your cares miles away... The scene of 'money money money' was fimed here. The taverna Korali on Agnontas beach is just about as fresh as it gets for seafood and as local as you can get for a Greek beachside dining experience. The imaginations of many travellers were fuelled by the magnificent scenery in the Mamma Mia movie, beautiful romantic locations touched by the spirit of fun, independence and adventure woven through the story. What serendipity might happen if you visit? 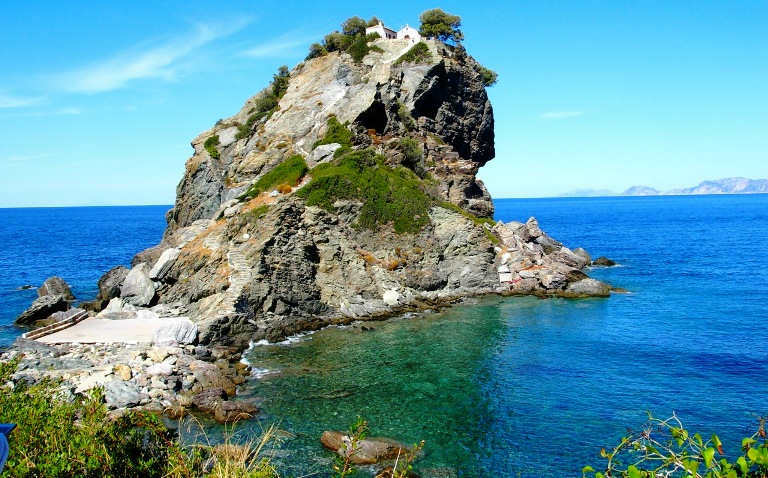 Travel Skopelos - The closest accommodation to the romantic clifftop chapel of Agios Ioannis is to be found in Glossa and the hinterland. 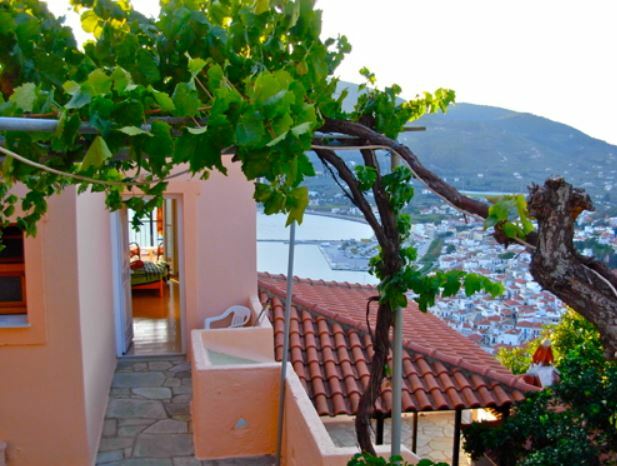 Here you will find many luxury villas but the style of Villa Eleanorae is hard to beat, as is the view (above). Just 3 km to the port of Loutraki and 6 km to the famous Mamma Mia clifftop view, this is a very comfortable and romantic choice of accommodation in Skopelos. See the sitting room and kitchen below, this villa sleeps 5 comfortably with 3 bedrooms and 3 bathrooms, and has a lovely pool with an outdoor kitchen and BBQ area for maximising your outdoor living enjoyment. 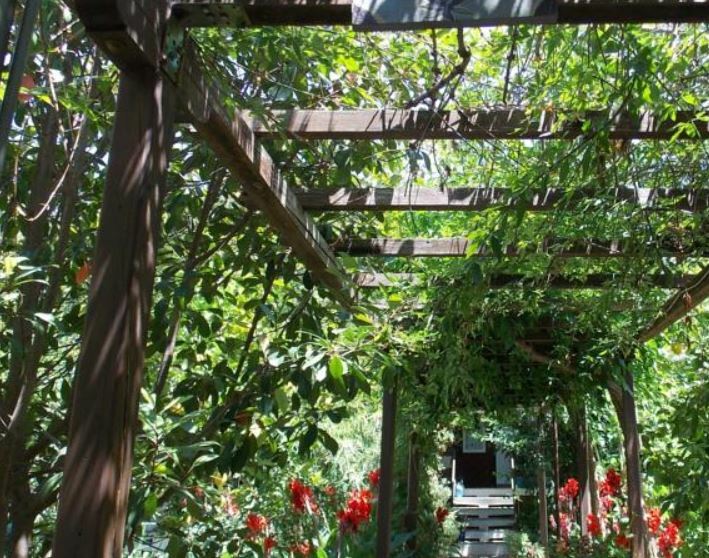 In the shady garden behind the pretty cove of Agnontas is Stamatia's Garden pension (above), giving a true Greek seaside experience with a lush green garden in the coolness of the trees. The host Eva makes this a memorable stay as do the fresh fruits and vegetables from the kypo (garden). 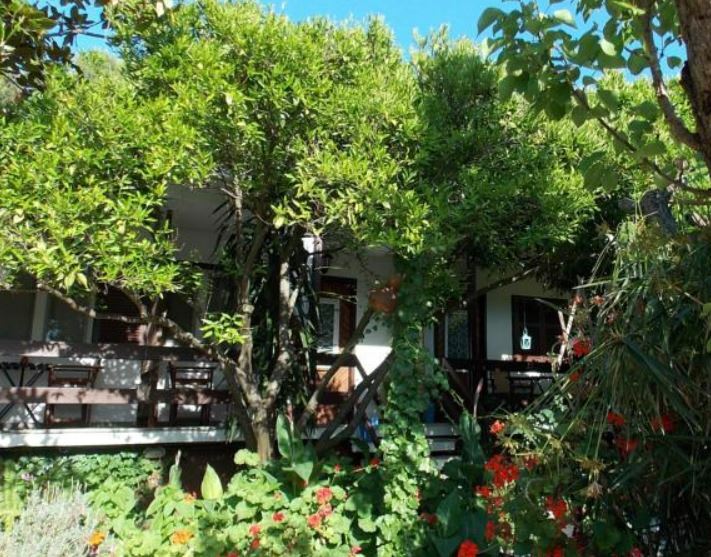 A cosy affordable and comfortable stay in a stunning location in Skopelos. 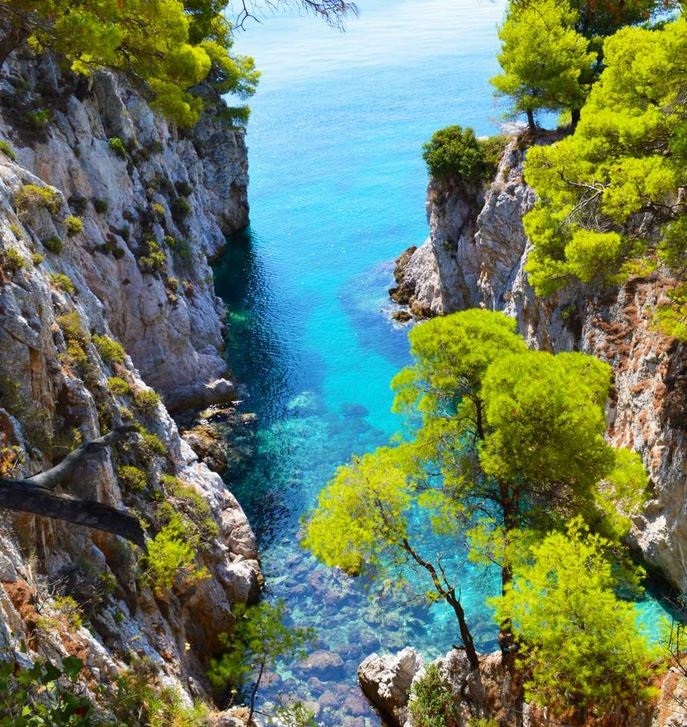 When will you follow your heart to Skopelos island?